If you are looking for a strong, well-made, well-designed Safety Harness to keep your loved-one safe, you have come to the right place. If you are looking for a pretty fabric wrap with single-row stitching, or stuffed animal backpacks with plastic d-rings and plastic snap hook detachable leads the length of your arm, then keep going because you won't find anything like that here. We specialize in tethers and harnesses. Every item we make receives the same level of attention and high-quality craftsmanship that over the years has resulted in the success and growth of this business. All Safety Harnesses and Tethers from Childharness.ca are walking harnesses for the purpose of keeping your loved one out of traffic, whether that loved one has just learned to walk or is someone with special needs with no concept of danger when out in our communities. We started our business in 2006. Our customers include families across Canada, the USA, Europe and Australia, and an increasing number of Community Organizations, Schools and Independent School Districts (ISD). If you are from one of these organizations and need to purchase a Special Needs Safety Harness for a child with special needs under your care, information regarding Purchase Orders, Sole Source letters and other details you may need is on our Schools & Community Orgs page. Please note that all Safety Harnesses from Childharness.ca are sold exclusively through this website. If you are from a Medical Supply Company and are ordering for one of your own customers, please see our Medical Supply Co.s page. The HCPCS billing code for the Child-to-Adult Safety Harness is "E1399, Durable Medical Equipment, Miscellaneous". Our Child Safety Tether is a simple yet effective way to keep your child by your side. 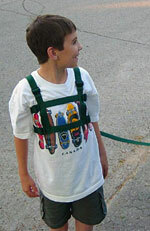 These Tethers are ideal for children who DO NOT need the full security of our Special Needs Safety Harness. 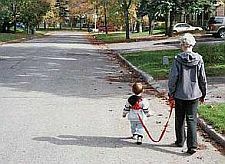 Both the child and the parent wear a belt, and a 4 foot tether connects the two. 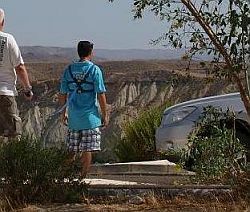 The tether can be held in the parent's hand, or slipped onto their own belt to be "hands free". Order tethers of different lengths, or add features such as a Locking Buckle or a Snap Hook to your Tether System so it best suits your needs. You can watch a short video that describes the Baby Harness and the benfits of this unique design. 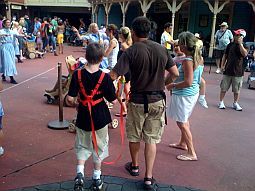 You can watch two videos of the Special Needs Safety Harness; one is a demo that shows the harness being fitted on a (neurotypical) 6 year old, the other shows you the main features of the design. 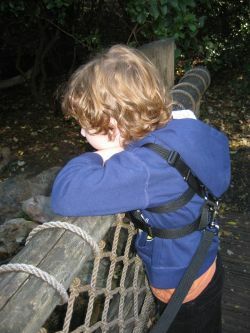 If you have a taller or larger toddler on your hands who is rather strong for their tender years, then the Special Needs Safety Harness is the harness you need. The 2 chest straps of this design makes this harness the ideal fit for larger bodies. If you have a child with special needs; someone on the Autism spectrum, diagnosed with ADHD, Down syndrome or another neurological disorder that inhibits their judgement or behaviour, the Special Needs Safety Harness is the harness for them. This design is extremely secure yet comfortable to wear all day, every day so you can travel to school and appointments safely. Order one of our Sweatshirts to wear over the Special Needs Safety Harness to keep your child warm on your walks. 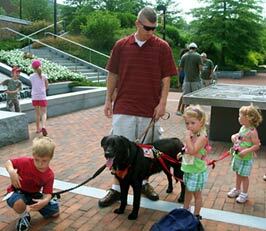 The training agency where you collect your autism service dog may or may not provide you with a means to tether your child to their new companion. 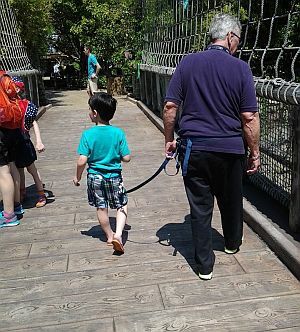 If your child is unwilling or unable to constantly hold onto the dog's lead during your outings, use one of our Waist Belt Tethers to connect your child to their autism service dog while you hold the dog's lead. Choose a Regular Waist Belt or Weighted Waist Belt. If you have, or are getting, an autism dog for your child, you may need a safety harness to keep the two of them together. 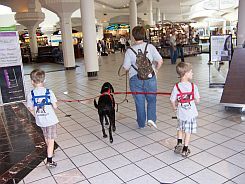 This Safety Harness to use with an autism dog has the added feature of a front lead that extends from the harness your child wears to the dog's collar. an extra buckle can be added to the harness and the lead so the Lead can be Used as a Tie-Down. Wrap the lead around the back of the chair and buckle them in to keep them seated. order a Permanent Handle at the back of your Baby Harness or Special Needs Harness to keep your child right at your side when walking short distances or in crowded locations. Buckle Covers prevent the back buckle from sliding open if the person reaches behind and attempts to remove the harness. Buckle covers fit over our regular buckles or our Locking Buckles. your harness can be made with Locking Buckles instead of regular buckles to stump the most determined escape artist. These buckles need 2 hands to open. Add buckle covers for maximum security. 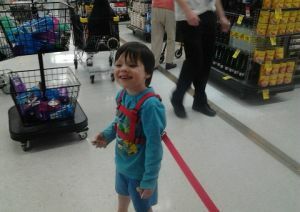 a Chair/Stroller Strap Attachment can be used with the harness to keep your child seated in their chair. This extra strap is excellent for using with a number of different chairs in your home and community. 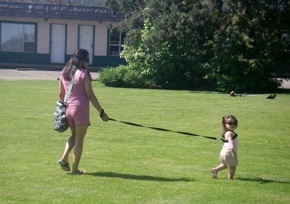 use a Hands-free Parent-to-Child Tether to keep your child close to you while keeping your own hands free. Excellent for parking lots, and crowded areas such as malls and theme parks. a Crotch Strap can be added to the Special Needs Harness to further increase security. carry a "Child with Autism on Board" or a "Person with Special Needs on Board" sign in your car window to alert medical and rescue personnel in the event of an accident.